You are invited to attend our Parish Mission the evenings of October 28, 29 and 30, conducted by Redemptorist Fr. Eugene O’Reilly. Please extend the invitation to your neighbours, friends and family members. Each evening begins at 7:30, and ends at 8:30 with the sharing of refreshments in the Marrevee Room. Don’t worry if you cannot commit to all the evenings – participate in the ones which are possible for you. Jesus revealed to his followers the secrets of God’s Kingdom. In a Mission he does the same for you. He reveals that his Kingdom is here and now and that it spells fullness of life for those who share in it. Happiness often it seems to elude us. We would like to change our lives, become “new people”, more alive. The Mission offers us this possibility. Can you make this Mission? Decide today to put off anything that may interfere. You deserve this rich new life God offers you. Affectionately known as “Red”, Fr. Eugene O’Reilly was born in Monoghan, Ireland in 1944.He came to Canada with his family and later joined the Redemptorists. Upon graduating with a B.A. from the University of Windsor, he pursued his theological studies in France and Montreal and was ordained in 1972.Since 1983 he has preached missions and retreats to parishes, teachers, school boards, clergy and religious throughout Canada and the U.S. 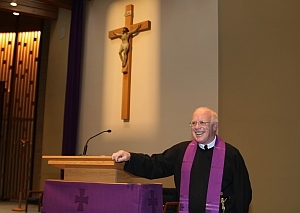 He has also served as pastor of St. Teresa’s Parish, Mundy Pond. He has a particular interest in music and has composed a number of religious songs. He has teamed up with other Redemptorists and together they have produced four recordings. Mission Preaching is Fr. Red’s full time ministry and he brings to it a ready smile, a wonderful sense of humour and a compassionate understanding of people and the complex world in which we live.